This week I was reminded about the early 70's when I was in the 'art' part of my university time. I studied and practiced painting, etching, drawing. The theme throughout all those wonderful times was observe nature. We've had a wonderful Wedgwood vase for many years and last week an organic teapot with a similar 'feel' joined the small group of 'organics' in our collection. 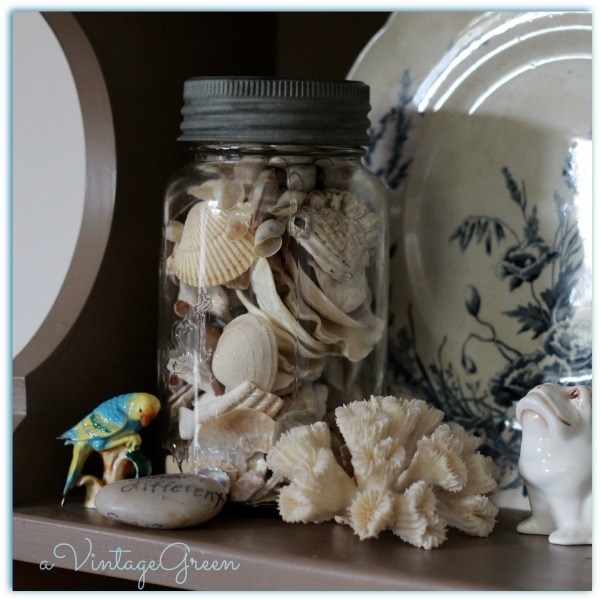 Seashells in a zinc lidded quart jar mixed with a bit of coral and memories. The colors are echoed in our kitchen. Not planned but today the dots connected. 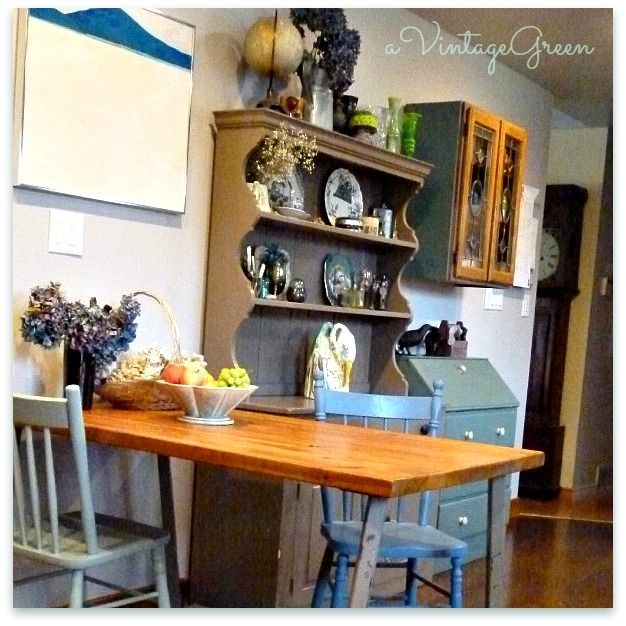 Joy - Looks like lots of good memories all put together in a beautiful vignette. Love getting a glimpse inside your world. That first photo is such a great vignette! Lovely. I like using shells and other natural elements also. You have a lovely place. I referred a blogger to you earlier this week. When I looked at her site, I knew she would want to visit yours. Lots of elements that meld together into a cohesive and beautiful arrangement. That is my very favourite of all the groupings you have done! The matte glazes, seashells, zinc, etc. are beautiful in texture and tone. I'm raving, I know, but this is really lovely! So very pretty. 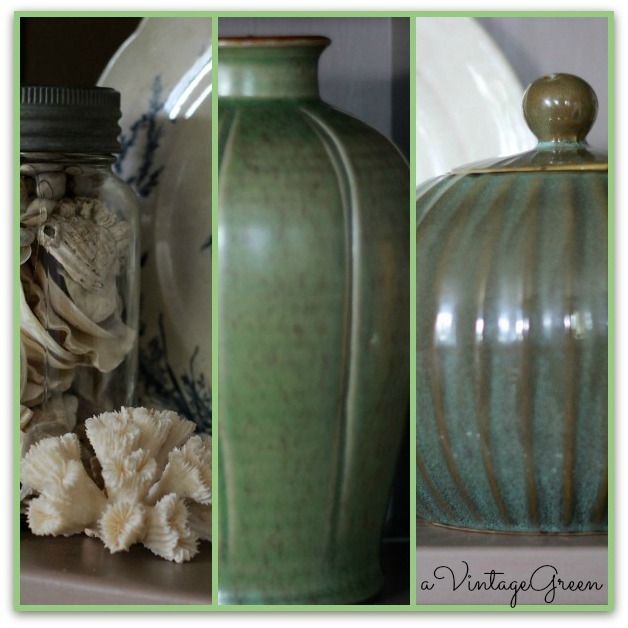 Love those beautiful "earth tones" - so calming. Lovely, Joy. I so appreciate the addition of natural elements to your displays. Nature gives us so many wonderful shapes and textures. 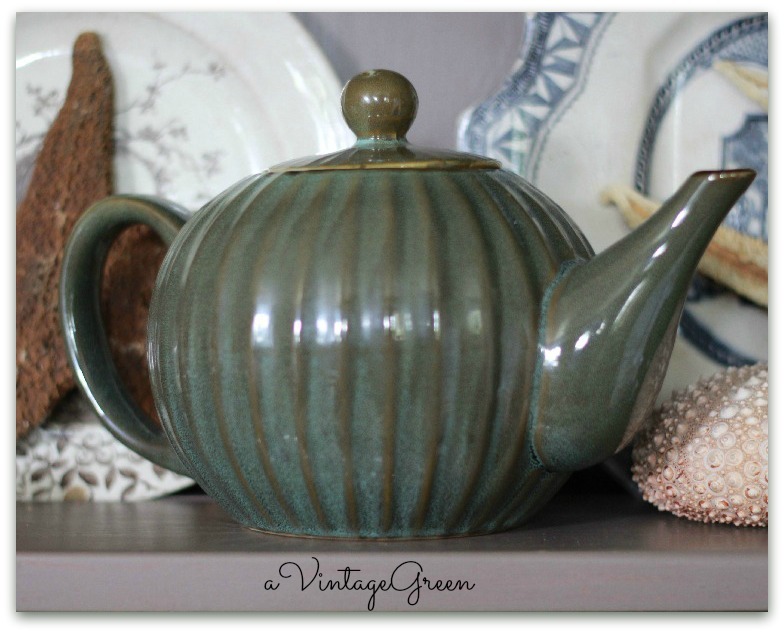 Love your vignettes, especially that tea pot. 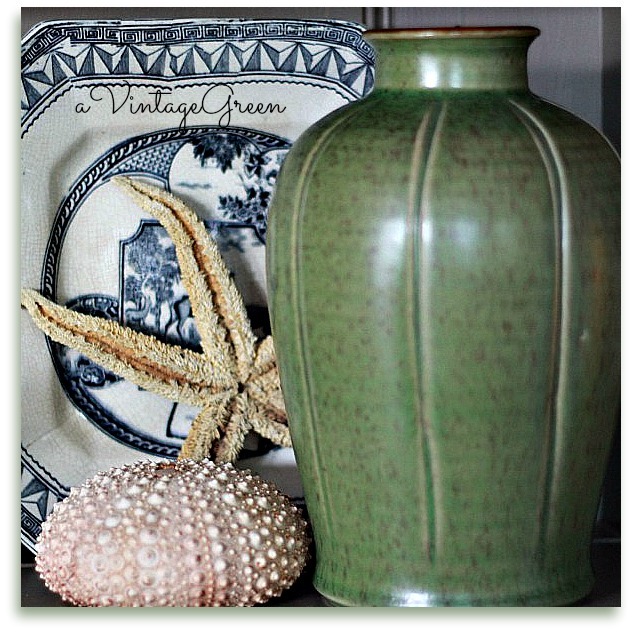 Love how sea shells a dd so much texture to the vignettes. I'm admiring that blue and white plate peeking behind the other goodies. Thanks for joining in to Blue Monday, Joy. Very pretty! Love that shade of green and beautiful pieces. A "memorable" vignette! Clearly you've had some good times! I'm loving all the seashells, and the organic-ness of it all. I love natural elements! You have a nice selection of things. I really like the green vase and tea pot.